ABDULLAH II, King of Jordan, noting what he called historic changes in his region this year, said that “the Arab Spring can be an opportunity to institutionalize positive change, change that is necessary for a strong, secure, prosperous future”, building on the achievements of Arab-Islamic civilization and its values of compassion, responsibility, tolerance and respect. In his own country, he said, that opportunity meant opening the door to “a major revitalization of our reform effort”, in an inclusive way that could achieve the goal of parliamentary government and embed a democratic way of life that included the responsibility to participate in political parties. It also meant “building reform into reform”, including the rule of law, justice and the rights and freedoms of political life. In that context, a review of the country’s Constitution had been conducted and Parliament was putting the final touches on amendments for ratification. Among key provisions were an independent constitutional court and elections commission. Turning to the Palestinian-Israeli conflict, he described “a dangerous impasse” in negotiations. “Frustrations are at a peak,” he added, pointing to continued Israeli settlement activity despite international protest in Jerusalem, and touching on final status issues that he stressed could only be resolved through negotiations. He warned of a severe crisis that would arise from harm to the holy sites of any faith in that city, adding that Muslims around the world were bound by “a sacred chain”. Only a two-State solution that met the needs of both sides could bring about lasting peace. Thus, negotiations must go forward, and the key issues of borders, Jerusalem, refugees and settlements must be resolved. He said that Arabs viewed positively the parameters for a solution set out by United States President Barack Obama and ideas put on the table by the diplomatic Quartet, but Israel responded by building settlements. 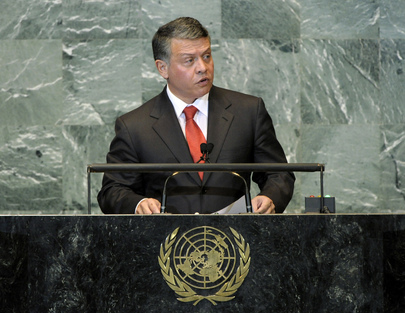 In the resulting impasse, Jordan and the Arab States were holding fast to the principles of peace and law and had come to the United Nations “to seek the justice of nations”. It was the right of the Palestinian people to come to this “house of nations” to seek to fulfil their aspirations in accordance with United Nations resolutions and within a comprehensive settlement. “This we must all support”, he said. In that context, he said, he sought “a new and vigorous international push, with concrete steps toward the end-game. Not words, not process”. What was sought was a peace that came from statehood and recognized rights for Palestinians and that brought real security to Israel, ending “their fortress mentality and achieving acceptance in their neighbourhood and the world”. Around the world, too many people’s hopes for the basic components of a better life were unanswered. “But a new era is beginning in my region, with new opportunities to move forward in democracy, security and peace,” he concluded.